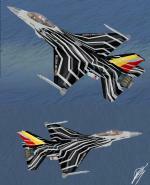 This the new 2015 livery of the Belgian F-16 Solo Display team. This year, owned by the 10 Tac 349 sqn, from Kleine Brogel, the VIPER they are flying is the FA-123. This pack contains two models. One clean model with smokewinders on the wingtips, and the other is without smokewinders, but with alpha channels. This pack is also fitted with: VC / Smoke / Flares / and Afterburner (Auto triggered) Repaint and effect additions by: Mees Jansen Also useable in FS2004! This new aircraft.cfg fixes the turning and shakin behavior when the aircraft has stopped on ground! Simple replace or overwrite the old aircraft.cfg with this new one! This is an update for FSX of the Railroad Valley version of the Iris F-15E. I have modified the 2D panel to include a pitch trim gauge, the landing gear lights from the VC, a flaps gauge and a speed brake light. I also changed the 2D hud and edited out nonfunctional parts of the panel like one of the bitmaps and the mini panel section of the panel.cfg. I also updated the flight dynamics so it makes mach 2.5 at 37,000 ft. and did the usual correcting of the contact points and things like the wing apex position. This is the whole aircraft. This is an FSX Update for the FS2004 Douglas Skyhawk by Kazunori Ito. The package features 3 models and 4 paints. The focus of this update is on a completely re-modelled and enhanced VC and 2D panel. New smoke effect and burner flame have been added and the flight tuning has been altered, as the thrust of the original model was too powerful for the aircraft. Original model by Kazunori Ito and earliar FSX update by Bruce Fitzgerald. New VC and 2D panel as well as new burner flame and smoke effect by Michael Pook. This is an FSX update for the Alphasim Lockheed C-5 Galaxy. The package features a modified and enhanced VC which now has more gauges added than the original VC had. The panel has corrected popup windows for the autopilot and other gauges as well. In addition, four great repaints by different authors are included in the package. Also, The aircraft has now new smoke effect. Original model by Alphasim, repaints by unknown authors, camera views by Erwin Welker and new panel modification and smoke effect by Michael Pook. This is a panel update for two different models of the Lockheed Martin F-16. The package includes the original paint by Kirk Olsson and seven beautiful repaints by different authors. The focus of this update lies on a newly configured VC and 2D panel, as one of the two models had a VC which wasn't editable in some of its sections. Now, just about all the gauges of the VC, some of them original, some new, are functioning. All the models display full loadouts, due to the fact that only the Viperden model file, which is only assigned to the editable VC and a full loadout, enables it to be edited entirely. So some of the repaints like the Thunderbird that originally were clean models have now full loadouts as well, but to give them a fairly authentic appearance the pylons have been repainted to match the fuselages. Original model by Kirk Olsson and FSX Update by Danny Garnier, repaints by Mees Jansen, Kirk Olsson, Claus Vendelboe Holmberg and Juan 30005 (original name unknown). New model compilation, new VC and 2D panel configuration, new repaint modifications as well as new smoke effect by Michael Pook. Update Air file and Aircraft.cfg parameters for IRIS AV-8B Harrier II .